Our head quarters and manufacturing facility in the Midlands is the home of our industry leading Design & Innovation Centre - incorporating a four-bed bay mock-up ward and a concept room. Based on the well established ProCure22 repeatable rooms design and supported by leading suppliers to the health sector, the multi-bed ward is a fully fitted area where visitors can view a range of facilities and options including: bedhead services trunking, nurse call, medical lighting, patient hoists and privacy screens. The concept room - focusing on patient safety, the patient environment and workflow efficiency, showcases a number of exciting new initiatives to help nursing management teams improve levels of patient satisfaction and patient care. 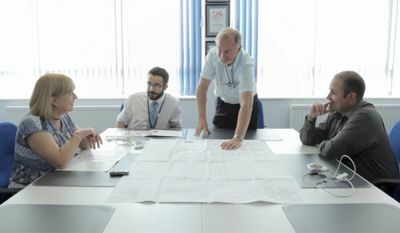 It's that the facility will be used by the wider industry to test, trial and develop conceptual ideas and new solutions. We want to encourage closer collaborative working among equipment suppliers and specialists, nursing management teams, patient representatives, design groups, and other interested parties. To enable the on-going provision and delivery of world-class buildings and facilities. To help improve healthcare outcomes for all. Whether you are a healthcare planner, an architect, a constructor, a clinician or an allied supplier, we’d love to show you around. To discuss the issues you face today and the challenges you see on the horizon. To offer support, to work together and to find solutions.